The other day I came across a clip of actor Terry Crews as a guest on the show The View. In the clip, Terry Crews was basically defending fatherhood and I was somewhat amazed at how at times it seemed like one or more of the hosts of The View kept trying to attack fatherhood (the clip is at the end of the page). I realized that fatherhood in general is greatly under valued in today’s society. So many of us have grown up without reliable fathers or father figures in our lives that we diminish the importance of fathers. So many women have been forced to raise children without a decent man in their children’s lives that they start to believe that a child having a father or father figure is an option that they’d prefer to do without. As men we have to take some blame in this. Many of us have let or children and women down so much that we are considered elective pieces of the family dynamic and are often made to feel that way. Some women will try so hard to prove that they don’t need a man that they will also imply that their children don’t need a father either. I’m not just talking about single mothers either. Even in marriages the father is often relegated to a relatively small role in raising the children. Sometimes fathers withdraw nearly completely from the task of helping raise the children, believing that child-rearing is a woman’s job and all they have to do is provide. And while many single mothers do awesome jobs raising well-rounded children, especially the ones that have to, more often than not, those children struggle from the absence of a strong, positive male role model in their lives. I am not saying that any man will do. Some men are bad fathers, bad role models or just bad people in general. They will do more harm to a child’s development than good. However, there are many good men who want and try to be good fathers, but are limited or not allowed to because of their child’s mother. When I worked as a children’s therapist I ran into many women who moved multiple states away just to punish their child’s father. They were mad at him for whatever reason and decided to not only distance themselves from him, but to distance him from his children as punishment. Many single mothers push their child’s father away either by making it extremely hard on him to see his children, or by turning the children against him. They want to make the father feel unwanted and unneeded and if the man isn’t strong enough, he may give up and walk away or greatly diminish his involvement in his child’s life. Most of the times these children not only suffered from behavioral problems like stress, depression and anxiety, but many of them, especially the young boys ended up acting out in ways that the mother couldn’t handle, especially as they got bigger. Many of the boys became disrespectful to the mother and women in general. They did poorly in school, got in trouble with the law and basically became unruly and why wouldn’t they? They were trying to figure out how to grow into a man without any decent examples and so they come up with their own, either modeling other young men, poor examples from their neighborhoods, or rappers, athletes or other celebrities. Some of these same women often sent their boys back to live with their fathers once they got too out of hand, but by then the father-child bond has usually been so disrupted that the father doesn’t know how to effectively parent that child and the child has little understanding or respect for a parent who has been absent from their lives over a period of time. While I feel that it is extra important that boys have a good male role model, no matter if it’s their biological father, stepfather, uncle, coach, teacher or any other reliable, nurturing, male, it is important that girls have a father figure as well as I wrote in my post absent fathers can lead to depression in teenage girls. Healthy and respectful male role models can teach young girls how they should expect men to treat them. While at the same time, even fathers who are in the house that are angry and disrespectful to the mother are more likely to have children that develop anxiety, are withdrawn and are more likely to have unhealthy relationships. So you see, it’s not just about having a man around, it has to be someone who is giving positively to the child’s social-emotional well-being. 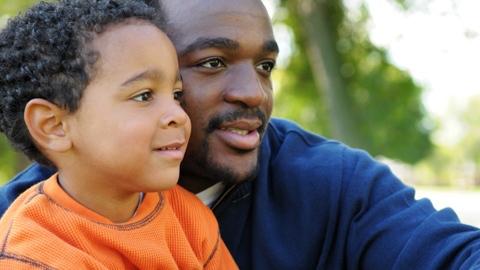 Involved fathers have an impact on a child’s emotional health, cognitive ability and educational outcomes. Children with involved and nurturing fathers are more likely to be emotionally secure, confident, willing to explore their surroundings and end up with better social relationships. They are less likely to get in trouble at school, have disruptive behaviors or develop anxiety and depression. Studies suggest that fathers who are nurturing, involved and playful with their infants end up having children with better linguistic skills, cognitive skills and higher IQs. Toddlers with involved fathers tend to start school more academically ready, more patient and less likely to get frustrated or stressed when compared to toddlers with absent fathers or fathers who aren’t involved. Adolescents and teenagers with involved, active and nurturing fathers tend to have better intellectual functioning, better verbal skills and higher academic achievement. All of these benefits are amplified if that involved, nurturing male is the biological father, but it doesn’t have to be in order to still see positive benefits. I’m not saying that any man will do, or even any biological father because any idiot can become a dad, it doesn’t mean that they will be the best role model for a child. What I am saying is that having a father figure is just as important as having a mother figure for every child. Fathers have a powerful and important impact on the development and health of a child.